are Traditional Lime Plasterers our expertise and approach to care and repair of period property is our trademark.Our services include, Traditional Haired/ lime/chalk plastering. 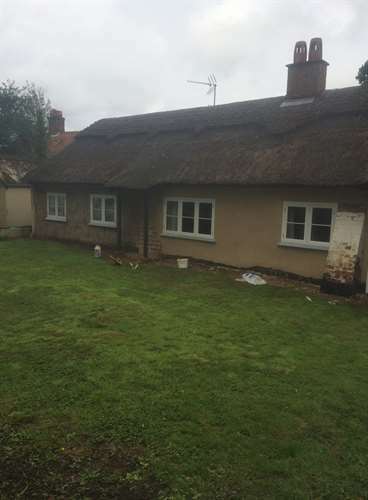 Repairs undertaken for ClayLump, Cob, and Wattle and Daub.We also re-furbish old and new buildings,including re-pointing red brick and flint walls. We also offer a consultancy for damp problems and materials in old property.For inquiries and info for your projects do contact us and have a chat. Lime plastering to an historic attic storey of a 16th / 17th century timber house, including installation of entirely new lath work to walls and ceilings. "Bruce and the Maltby Plastering team have done an exceptional job and we are delighted with the quality, care and diligence with which they undertook the works. They are passionate craftsmen with nothing but the best interests of the building at heart, approaching their work with real enthusiasm and offering excellent advice. They have been excellent house guests, tidying as they go, and I have no hesitation in recommending them." Plaster (lime) of living room and study including around fiddly beams, repairing cob wall - All walls and ceilings. who take such pride in their work they added special features which we love. They even mopped the floor and washed up each day! we will definitely use them again. " Lime rendering to our house. "The work was carried out to a very high standard. Attention to detail was excellent. Happy and courteous and polite team. Meticulous! Results of rendering were superb." Lime render interior and exterior of barn. All prep work. Rebuilding of necessary plinth brick and flint work. All to be completed sympathetically to the type of building. "Professional, but kind, friendly and helpful. Took all our wishes into account. Good explanation of processes." Inside and outside lime plastering. "Excellent work and would highly recommend them. Am using them again next year for further traditional lime work." Re plaster wall in time. Lime plaster. "Bruce & lad arrived on time, worked effectively, explaining each step as requested. Very pleasant friendly team. Completed job on time and with very little mess, at agreed price. I would highly recommend to anyone." Thanks Bruce for a great job. Plastering of internal walls in 2 rooms. Lime plaster over clay lump. New ceilings to bathrooms. "We were very pleased and delighted with the work. We appreciated Bruce�s extensive knowledge of traditional materials. We valued his ideas and suggestions and will be asking him to undertake further work later in the year. Although specialist plaster work is more expensive we feel Maltby�s is value for money." Re-lathe and traditional home plastering of C17 stairwell. "Bruce and his team were a joy � carefully and with great expertise bringing the oldest part of our house back to life. Their skill is second to none and we would tenderheartedly recommend them. We learnt so much!" Application of time render to new build external walls (Novalit/Heraklif boards). "A professional team who started and finished the project on time and on budget. If only all tradesmen were like this! I have no hesitation in recommending Maltby Plastering to others." Traditional lime & hair plaster & new. "Excellent in every way: - quality of work. Polite & courteous & professional. I would only use Maltby Plaster�s and have already recommending to friends." "Have used this company before and would have no hesitation in recommending them. Tremendous craftsmanship and attention to detail." Work was to remove Artex, install new plaster wards and plaster. "Work was completed within time scale and to a satisfactory standard. Visually the work looks perfect." Lime plastering and plastering in a new outbuilding. "After getting several quotes I was recommended to tray Maltby who quoted and were able to give a start date. The work was completed promply and as per quote. They were also able to recommend other trades." Digging out old lime and cement from outside and inside of barn flints and bricks and re-instate with new lime plaster. "A professional and reliable team who have gone beyond my expectations and take their work and commitment very seriously. I cannot praise them enough. They came highly recommended to me and I now know why." "I�ve never been happy with any plasterers until I met Maltby Plastering, clean efficient & very friendly. I will most definitely be using Maltby Plastering again." Plastering and dry lining 2 room extension, walls and ceiling. "Bruce and Luke were a pleasure to have in the house- friendly, considerate and very skilled. We discussed the finish we wanted up front and they did exactly what we wanted � it looks great and we are so pleased with the work.